In my formative years I studied art under a private tutor who taught me the drawing basics. During my twenties I began to experiment with acrylic and oil mediums. However, I clung to my pencils and charcoal until I sold my first painting. That gave me the confidence to branch out and try other mediums like watercolor, gauche and pastel. In the end I settled on acrylic and oil, although I love pastel! As an adult, I traveled the U.S. to experience the variety of cultures and landscapes that make up our beautiful country. While living in Arizona, I was introduced to the art of the Southwest. I fell in love with the vivid colors and realistic style the artists use to tell the story of the American Southwest. The Southwestern style has been a major influence on my work. I am an avid gardener and with the help of my husband have created a haven for wildlife in our yard near the Gulf of Mexico in Northwest Florida. My concern for wildlife habitat loss and the devastating effects of urban sprawl has led me to study, paint and deeply appreciate the indigenous wildlife of North America. I also donate to local wildlife and animal charities on a regular basis. If you purchase a painting let me know if you have a favorite wildlife or animal charity and I will donate 10% of the purchase to that charity. My husband and I serve as a foster family for unwanted pets from time to time. We share out home with 2 cats and one sweet puppy! 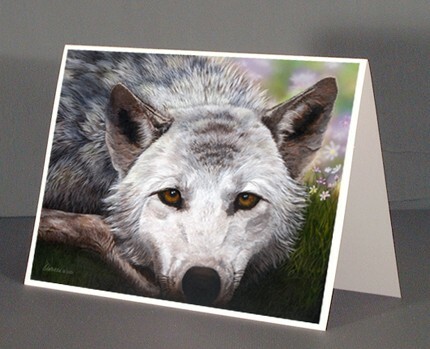 These note cards make great gifts or use them to send messages to your friends and loved ones. They are also the perfect size (5”x7”) to frame! They fit neatly in any standard 5”x7” picture frame. Odessa Kelley created these Fine Art Note Cards from one of her original acrylic painting. The inside of the card is blank. On the back of the card is a short paragraph about the artist, Odessa Kelley, her web address and the title and copyright information of the image. This box of 8 note cards is packaged in a clear box with an informational sticker on the outside back.